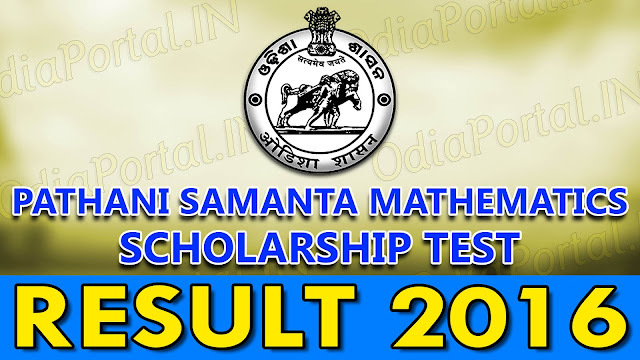 Board of Secondary Education, Odisha has published the result of this years Pathani Samanta Mathematics Scholarship Test (Pathani Samanta Ganita Meddhabrutti Pariksha). Candidates (Both Stage I [Class-VI] & Stage II [Class-IX]) who were appeared in this test can check and download plus print their result right here on OdiaPortal.IN. Pathani Samanta Mathematics Scholarship Test 2017 - Stage 1 (Class - VI) & Stage 2 (Class - IX) Candidates can check their results below. How To Check your Result Online? 1. Click on below link to enter in official website. 2. Enter your PMST 2017 Roll Number. OR Enter your Full name in provided blank box & Click on SUBMIT. 3. After few seconds you will get your result sheet. In the sheet you will see your Full Mark along with percentage of marks. 4. Now print your result in a paper or save as PDF to your computer or PC.